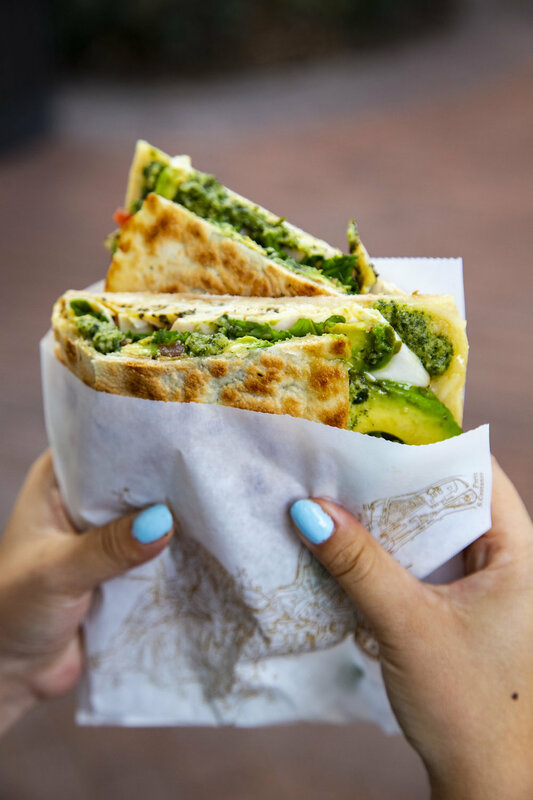 Piadina is a rustic Italian flatbread sandwich, prepared with dough cooked fresh on a griddle and typically filled with a variety of meats, cheeses, and vegetables. Piadina Italian Market Sandwich is proud to bring to Southern California the legendary flavors of Italy. Our unique Piadina bread is a recipe that was born out of a desire to improve the traditional piadina by making it lighter, while still preserving its original sought-after taste. In a process that spanned over 10 years and involved acclaimed Italian chefs and Italian agricultural experts, a new recipe was perfected. The result is our own unique Piadina that is both light and crispy. Made only using natural ingredients. The dough is made fresh every morning and is cooked at the time you place your order- all to maximize freshness. 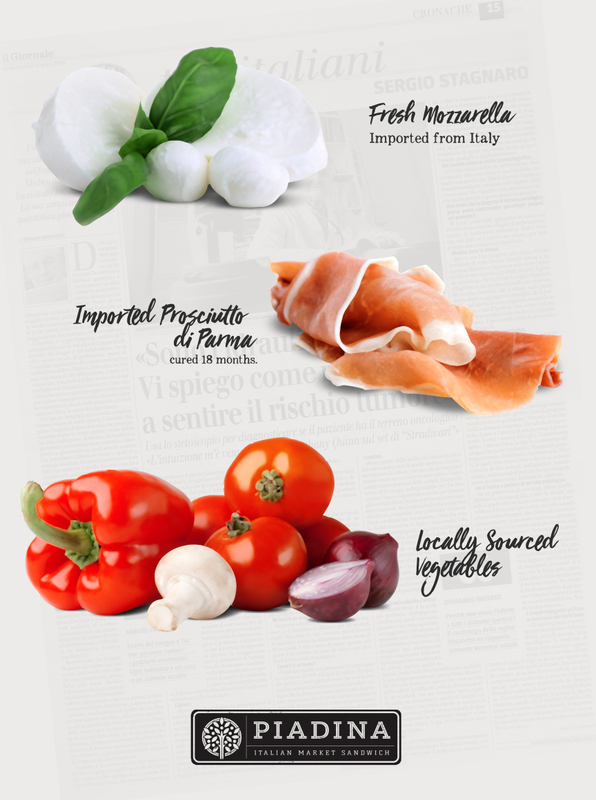 Our fresh mozzarella is flown in weekly from Italy. Handcrafted in a small town 10 kilometers from the Amalfi Coast. The pristine, nutrient-rich valleys breed cows that produce some of the highest quality milk products available today. The milk is collected during the day and before dinner, it is delivered to a small artisanal processing facility, where it will be transformed into mozzarella balls through a careful process that will be completed in less than 24 hours. Milk that was collected on a Wednesday will be in your Piadina on Saturday! Pretty amazing! Our meats are all natural and 100% preservative free. Our Prosciutto di Parma, for example, is only seasoned with salt and pepper & dry cured in a special environment in Parma, Italy, for 24 months before it reaches your Piadina sandwich. Our menu includes a variety of options for our Piadina sandwiches, pasta and salads. Rustic Italian flatbread sandwich, prepared with dough cooked fresh on a griddle and typically filled with a variety of meats, cheese, and vegetables. An Italian soft-ripened cheese of the Stracchino family. It is from the Langhe region and made with varying proportions of cow's, goat's and sheep milk. Italy, Piadina's home country and the source of much of our inspiration. Leafy green vegetable native to the Mediterranean region with a strong peppery flavor and rich in vitamin C.
Thinly slices dry-cured Italian ham, carefuly prepared and dried over the course of several months.